The term agile was first coined for this in 2001, in the Manifesto for Agile Software Development (Agile Manifesto), and although originally written as Agile (with a capital A) this is progressively becoming deprecated. Incremental software development methods can be traced back to 1957. Evolutionary project management and adaptive software development[note 1] emerged in the early 1970s. During the 1990s, a number of lightweight software development methods evolved in reaction to the prevailing heavyweight methods that critics described as heavily regulated, regimented, and micro-managed. These included: from 1991, rapid application development; from 1994, unified process and dynamic systems development method (DSDM); from 1995, Scrum; from 1996, Crystal Clear and extreme programming (XP); and from 1997, feature-driven development. Although these originated before the publication of the Agile Manifesto in 2001, they are now collectively referred to as agile methods. While the secondary concerns were important the primary concerns were more critical to success. Later, Ken Schwaber with others founded the Scrum Alliance and created the Certified Scrum Master programs and its derivatives. Schwaber left the Scrum Alliance in the fall of 2009, and founded Scrum.org. In 2005, a group headed by Alistair Cockburn and Jim Highsmith wrote an addendum of project management principles, the Declaration of Interdependence, to guide software project management according to agile software development methods. In 2009, a movement by Robert C Martin wrote an extension of software development principles, the Software Craftsmanship Manifesto, to guide agile software development according to professional conduct and mastery. In 2011 the original Agile Alliance created the Guide to Agile Practices, an evolving open-source compendium of the working definitions of agile practices, terms, and elements, along with interpretations and experience guidelines from the worldwide community of agile practitioners. Related disciplines, including project management (PRINCE2 and PMI) and business analysis (IIBA) have extended or updated their bodies of knowledge and certifications to embrace working with agile methods. 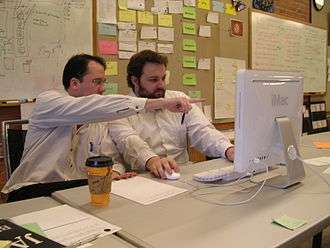 Pair programming, an agile development technique used by XP. Note information radiators in the background. There are many specific agile development methods. Most promote teamwork, collaboration, and process adaptability throughout the product development life-cycle. Most agile development methods break product development work into small increments that minimize the amount of up-front planning and design. Iterations are short time frames (timeboxes) that typically last from one to four weeks. Each iteration involves a cross-functional team working in all functions: planning, analysis, design, coding, unit testing, and acceptance testing. At the end of the iteration a working product is demonstrated to stakeholders. This minimizes overall risk and allows the product to adapt to changes quickly. An iteration might not add enough functionality to warrant a market release, but the goal is to have an available release (with minimal bugs) at the end of each iteration. Multiple iterations might be required to release a product or new features. A common characteristic in agile development is the daily stand-up (also known as the daily scrum). In a brief session, team members report to each other what they did the previous day toward their team's iteration goal, what they intend to do today toward the goal, and any roadblocks or impediments they can see to the goal. Specific tools and techniques, such as continuous integration, automated unit testing, pair programming, test-driven development, design patterns, domain-driven design, code refactoring and other techniques are often used to improve quality and enhance product development agility. Compared to traditional software engineering, agile software development mainly targets complex systems and product development with dynamic, non-deterministic and non-linear characteristics, where accurate estimates, stable plans, and predictions are often hard to get in early stages—and big up-front designs and arrangements would probably cause a lot of waste, i.e., are not economically sound. These basic arguments and previous industry experiences, learned from years of successes and failures, have helped shape agile development's favor of adaptive, iterative and evolutionary development. Development methods exist on a continuum from adaptive to predictive. Agile methods lie on the adaptive side of this continuum. One key of adaptive development methods is a "Rolling Wave" approach to schedule planning, which identifies milestones but leaves flexibility in the path to reach them, and also allows for the milestones themselves to change. Adaptive methods focus on adapting quickly to changing realities. When the needs of a project change, an adaptive team changes as well. An adaptive team has difficulty describing exactly what will happen in the future. The further away a date is, the more vague an adaptive method is about what will happen on that date. An adaptive team cannot report exactly what tasks they will do next week, but only which features they plan for next month. When asked about a release six months from now, an adaptive team might be able to report only the mission statement for the release, or a statement of expected value vs. cost. One of the differences between agile and waterfall is the approach to quality and testing. In the waterfall model, there is always a separate testing phase after a build phase; however, in agile development testing is completed in the same iteration as programming. Because testing is done in every iteration—which develops a small piece of the software—users can frequently use those new pieces of software and validate the value. After the users know the real value of the updated piece of software, they can make better decisions about the software's future. Having a value retrospective and software re-planning session in each iteration—Scrum typically has iterations of just two weeks—helps the team continuously adapt its plans so as to maximize the value it delivers. In a letter to IEEE Computer, Steven Rakitin expressed cynicism about agile development, calling it "yet another attempt to undermine the discipline of software engineering" and translating "Working software over comprehensive documentation" as "We want to spend all our time coding. Remember, real programmers don't write documentation." Agile methods support a broad range of the software development life cycle. Some focus on the practices (e.g., XP, pragmatic programming, agile modeling), while some focus on managing the flow of work (e.g., Scrum, Kanban). Some support activities for requirements specification and development (e.g., FDD), while some seek to cover the full development life cycle (e.g., DSDM, RUP). The Agile Alliance has provided a comprehensive online guide to applying agile these and other practices. Potentially, almost all agile methods are suitable for method tailoring. Even the DSDM method is being used for this purpose and has been successfully tailored in a CMM context. Situation-appropriateness can be considered as a distinguishing characteristic between agile methods and traditional software development methods, with the latter being relatively much more rigid and prescriptive. The practical implication is that agile methods allow product development teams to adapt working practices according to the needs of individual products. Practices are concrete activities and products that are part of a method framework. At a more extreme level, the philosophy behind the method, consisting of a number of principles, could be adapted (Aydin, 2004). Some approaches, such as Scrum and extreme programming, make the need for method adaptation explicit. With these less-prescriptive frameworks, one of the principles is that no single process fits every product development, but rather that practices should be tailored to the needs of the product. Mehdi Mirakhorli proposes a tailoring practice that provides a sufficient road-map and guidelines for adapting all the practices. RDP Practice is designed for customizing XP. This practice, first proposed as a long research paper in the APSO workshop at the ICSE 2008 conference, is currently the only proposed and applicable method for customizing XP. Although it is specifically a solution for XP, this practice has the capability of extending to other methodologies. At first glance, this practice seems to be in the category of static method adaptation but experiences with RDP Practice says that it can be treated like dynamic method adaptation. The distinction between static method adaptation and dynamic method adaptation is subtle. Scrum isn't designed for method tailoring. Schwaber notes that "Scrum is not a methodology that needs enhancing. That is how we got into trouble in the first place, thinking that the problem was not having a perfect methodology. Effort centers on the changes in the enterprise that is needed." Bas Vodde reinforces this statement, suggesting that Scrum isn't like traditional, large methodologies that require you to "pick and choose" elements. It is the basics on top of which you add additional elements to localise and contextualise its use. Further, James M. Kerr and Richard Hunter wrote a book on the subject that presented a day-by-day diary of a real RAD development. It covered work right from inception through to production and contains many of the techniques that forge the backbone of, and are very much present in, today's agile product development approaches. In 2008 the Software Engineering Institute (SEI) published the technical report "CMMI or Agile: Why Not Embrace Both" to make clear that the Capability Maturity Model Integration and agile methods can co-exist. Modern CMMI-compatible development processes are also iterative. The CMMI Version 1.3 includes tips for implementing CMMI and agile process improvement together. Organizations that adopt agile development see more frequent releases; which led to the concepts of continuous delivery and DevOps. While DevOps and agile software development both embody many Lean philosophies, such as collaboration and communication, they are distinct concepts. While agile principles represent a change in thinking, DevOps seeks to implement actual organizational cultural change. Agile development has been widely seen as highly suited to certain types of environments, including small teams of experts working on greenfield projects,:157 and the challenges and limitations encountered in the adoption of agile methods in a large organization with legacy infrastructure are well-documented and understood. Agile methods were initially seen as best suitable for non-critical product developments, thereby excluded from use in regulated domains such as medical devices, pharmaceutical, financial, nuclear systems, automotive, and avionics sectors, etc. However, in the last several years, there have been several initiatives for the adaptation of agile methods for these domains. The Scrum framework in particular has received considerable attention. Two derived methods have been defined: R-Scrum (Regulated Scrum) and SafeScrum. Teams and organizations choosing to adopt more agile ways of working typically undertake an agile transformation with the support of one or more agile coaches. The agile coach guides teams through the transformation. There are typically two styles of agile coaching: push based and pull-based agile coaching. Agile methods were first used by technology early adopters such as Tektronix. Although agile methods can be used with any programming paradigm or language in practice, they were originally closely associated with object-oriented environments such as Smalltalk and Lisp and later Java. The initial adopters of agile methods were usually small to medium-sized teams working on unprecedented systems with requirements that were difficult to finalize and likely to change as the system was being developed. This section describes common problems that organizations encounter when they try to adopt agile methods as well as various techniques to measure the quality and performance of agile teams. A survey performed by Version One found respondents cited insufficient training as the most significant cause for failed agile implementations Teams have fallen into the trap of assuming the reduced processes of agile development compared to other methodologies such as waterfall means that there are no actual rules for agile development. Agile development is a set of prescribed methodologies, and training/practice is a requirement. The agile process requires teams to meet product commitments, which means they should focus only on work for that product. However, team members who are seen as have spare capacity are often expected to take on other work, which means it is then difficult for them to help complete the work to which their team had commmited. Teams may fall into the trap of spending too much time preparing or planning. This is a common trap for teams less familiar with the agile process where the teams feel obligated to have a complete understanding and specification of all stories. Teams should be prepared to move forward only with those stories in which they have confidence, then during the iteration continue to discover and prepare work for subsequent iterations (often referred to as backlog refinement or grooming). A daily standup should be a focused, timely meeting where all team members disseminate information. If problem-solving occurs, it often can only involve certain team members and potentially is not the best use of the entire team's time. If during the daily standup the team starts diving into problem-solving, it should be tabled until a sub-team can discuss, usually immediately after the standup completes. One of the intended benefits of agile development is to empower the team to make choices, as they are closest to the problem. Additionally, they should make choices as close to implementation as possible, to use more timely information in the decision. If team members are assigned tasks by others or too early in the process, the benefits of localized and timely decision making can be lost. A common misconception is that agile development allows continuous change, however an iteration backlog is an agreement of what work can be completed during an iteration. Having too much work-in-progress (WIP) results in inefficiencies such as context-switching and queueing. The team must avoid feeling pressured into taking on additional work. Agile development fixes time (iteration duration), quality, and ideally resources in advance (though maintaining fixed resources may be difficult if developers are often pulled away from tasks to handle production incidents), while the scope remains variable. The customer or product owner often pushes for a fixed scope for an iteration. However, teams should be reluctant to commit to locked time, resources and scope (commonly known as the project management triangle). Efforts to add scope to the fixed time and resources of agile development may result in decreased quality. The best agile practitioners have always emphasized sound engineering principles. As a result, there are a number of agile best practices and tools for measuring the performance of product development and teams. The Agility Index Measurements (AIM) scores product development against a number of agility factors to achieve a total. The similarly named Agility Measurement Index, scores developments against five dimensions of product development (duration, risk, novelty, effort, and interaction). Other techniques are based on measurable goals and one study suggests that velocity can be used as a metric of agility. There are also agile self-assessments to determine whether a team is using agile practices (Nokia test, Karlskrona test, 42 points test). One of the early studies reporting gains in quality, productivity, and business satisfaction by using agile methods was a survey conducted by Shine Technologies from November 2002 to January 2003. A similar survey, the State of Agile, is conducted every year starting in 2006 with thousands of participants from around the software development community. This tracks trends on the benefits of agile, lessons learned, and good practices. Each survey has reported increasing numbers saying that agile development helps them deliver software faster; improves their ability to manage changing customer priorities; and increases their productivity. Surveys have also consistently shown better results with agile product development methods compared to classical project management. In balance, there are reports that some feel that agile development methods are still too young to enable extensive academic research of their success. Agile methodologies can be inefficient in large organizations and certain types of developments. Agile methods seem best for early-stage non-sequential product development. Many organizations believe that agile methodologies are too extreme and adopt a hybrid approach that mixes elements of agile and plan-driven approaches. Some methods, such as DSDM, have combined elements of agile and plan-driven approaches in a disciplined way, without sacrificing the fundamental principles that make agile work. The term "agile" has also been criticized as being a management fad that simply describes existing good practices under new jargon, promotes a "one size fits all" mindset towards development strategies, and wrongly emphasizes method over results. 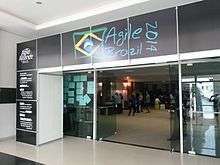 The agile movement is in some ways a bit like a teenager: very self-conscious, checking constantly its appearance in a mirror, accepting few criticisms, only interested in being with its peers, rejecting en bloc all wisdom from the past, just because it is from the past, adopting fads and new jargon, at times cocky and arrogant. But I have no doubts that it will mature further, become more open to the outside world, more reflective, and also therefore more effective. Agile methods have been extensively used for development of software products and some of them use certain characteristics of software, such as object technologies. However, these techniques can be applied to the development of non-software products, such as computers, motor vehicles, medical devices, food, clothing, and music; see Flexible product development. Agile methods have been used in non-development IT infrastructure deployments and migrations. Some of the wider principles of agile have also found application in general management (e.g., strategy, governance, risk, finance) under the terms business agility or agile business management. Under an agile business management model, agile techniques, practices, principles and values are expressed across five domains. Integrated customer engagement – to embed customers within any delivery process to share accountability for product/service delivery. Facilitation-based management – adopting agile management models, like the role of Scrum Master, to facilitate the day-to-day operation of teams. Agile work practices – adopting specific iterative and incremental work practices such as Scrum, Kanban, test-driven development or feature-driven development across all business functions (from sales, human resources, finance and Marketing). An enabling organisational structure – with a focus on staff engagement, personal autonomy and outcomes based governance. An education model that blends agile practices and philosophies to create micro-schools that emphasize collaborative culture creation and self-directed learning. Agile development paradigms can be used in other areas of life such as raising children. Its success in child development might be founded on some basic management principles; communication, adaptation and awareness. Bruce Feiler has claimed that the basic agile development paradigms can be applied to household management and raising children. In his TED Talk "Agile programming – for your family", these paradigms brought significant changes to his household environment, such as the kids doing dishes, taking out the trash, and decreasing his children's emotional outbreaks, which inadvertently increased their emotional stability. ^ Note by Edmonds: I presented these ideas in London in 1970 and first submitted the paper to the Journal Computer Aided Design. It was rejected with the comment "If you don't know what you are going to do before you start you shouldn't start"! Only then did I submit it to General Systems. ↑ "Agile With a Capital "A" Vs. agile With a Lowercase "a"". Rally. 2010. Retrieved 9 September 2015. ↑ "Evolutionary Project Management". Gilb. ↑ Martin, James (1991). Rapid Application Development. Macmillan. ISBN 0-02-376775-8. ↑ "Archived copy". Archived from the original on 9 February 2014. Retrieved 2013-11-24. ↑ "PRINCE2® Agile". www.axelos.com. Axelos Ltd. Retrieved 6 March 2015. ↑ Waters, Kelly (27 July 2011). "Agile Project Management – Extending PMBOK". All About Agile. Retrieved 23 July 2016. ↑ Hastie, Shane (10 Aug 2010). "IIBA announce Agile Extension to the Business Analysis Body of Knowledge". InfoQ. Retrieved 23 July 2016. ↑ Moran, A. (2014). Agile Risk Management. Springer Verlag. ISBN 3319050079. ↑ Gauthier, Alexandre (17 August 2011). "What is scrum". Planbox. ↑ Jeffries, Ron; Anderson, Ann; Hendrickson, Chet (2001). Extreme Programming installed. Addison-Weslsy. pp. 72–147. ISBN 0201-70842-6. 1 2 Boehm, B.; R. Turner (2004). Balancing Agility and Discipline: A Guide for the Perplexed. Boston, MA: Addison-Wesley. pp. 55–57. ISBN 0-321-18612-5. ↑ Lankhorst, Mark (2012). Agile Service Development. Springer-Verglag. pp. 17–19. ISBN 978-3-642-28187-7. ↑ Kerr, James M.; Hunter, Richard (1993). Inside RAD: How to Build a Fully Functional System in 90 Days or Less. McGraw-Hill. ISBN 0-07-034223-7. ↑ "TECHNICAL NOTE CMU/SEI-2008-TN-003 CMMI or Agile: Why Not Embrace Both". ↑ Humble, Jez; Farley, David (2011). Continuous Delivery: reliable software releases through build, test, and deployment automation. Pearson Education Inc. pp. 255–257. ISBN 978-0-321-60191-9. ↑ Ambler, Scott W. (12 February 2014). "We need more Agile IT Now!". Dr. Dobb's The world of software Development. San Francisco: UBM. ↑ Best Practices in Change, Configuration and Release Management (Report). Gartner. 14 July 2010. ↑ Martin Fowler. "Using an Agile Software Process with Offshore Development". Martinfowler.com. Retrieved 6 June 2010. 1 2 3 Fitzgerald, B.; Stol, K.-J. ; O'Sullivan, R.; O'Brien, D. (May 2013). "Scaling agile methods to regulated environments: An industry case study". 2013 35th International Conference on Software Engineering (ICSE): 863–872. doi:10.1109/ICSE.2013.6606635. ↑ Cawley, Oisín; Wang, Xiaofeng; Richardson, Ita (2010). Abrahamsson, Pekka; Oza, Nilay, eds. "Lean/Agile Software Development Methodologies in Regulated Environments – State of the Art". Lean Enterprise Software and Systems. Lecture Notes in Business Information Processing. Springer Berlin Heidelberg. 65: 31–36. doi:10.1007/978-3-642-16416-3_4. ISBN 978-3-642-16415-6. ↑ McHugh, Martin; McCaffery, Fergal; Coady, Garret (2014-11-04). Mitasiunas, Antanas; Rout, Terry; O’Connor, Rory V.; et al., eds. "An Agile Implementation within a Medical Device Software Organisation". Software Process Improvement and Capability Determination. Communications in Computer and Information Science. Springer International Publishing. 477: 190–201. doi:10.1007/978-3-319-13036-1_17. ISBN 978-3-319-13035-4. ↑ Beck, Kent (2000). Extreme Programming Explained. Addison-Wesley. pp. 1–24. ISBN 0201616416. ↑ Shore, James; Warden, Shane. Art of Agile Development. p. 47. ↑ Beck, Kent (2000). Extreme Programming Explained. Addison-Wesley. pp. 48–49. ISBN 0201616416. ↑ "State of Agile Development Survey Results". www.versionone.com. Version One. Retrieved 2014-06-08. 1 2 May, Robert. "Effective Sprint Planning". www.agileexecutives.org. Retrieved 2014-06-14. ↑ McMillan, Keith. "Time, Resources, Scope… and Quality.". www.adeptechllc.com. Retrieved 2014-06-15. ↑ "Agility measurement index". Doi.acm.org. Retrieved 2 April 2010. ↑ "2013 State of Agile report: Why Agile?". stateofagile.com. 27 January 2014. Retrieved 13 August 2014. Dingsøyr, Torgeir, Dybå, Tore and Moe, Nils Brede (ed. ): Agile Software Development: Current Research and Future Directions, Springer, Berlin Heidelberg, 2010. Shore, J., & Warden S. (2008). The Art of Agile Development. O'Reilly Media, Inc.